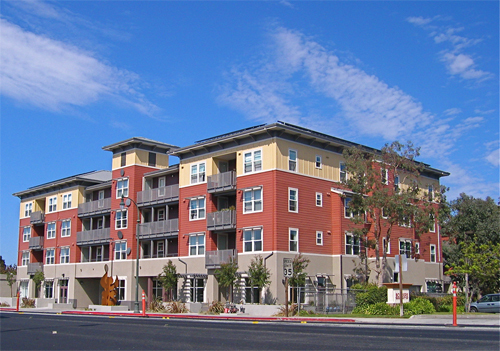 Peoples Associates provided the structural design for Peninsula Station, an affordable family housing development in San Mateo. Peninsula Station is a 2011 Green Building Award Winner from Sustainable San Mateo County, and achieved a GreenPoint Rated status with a score of 153 points. At the time of its completion, this project achieved the second highest GreenPoint rating by a multi-family residential project in California. Peninsula Station is comprised of two residential buildings over a subterranean garage. The design provides 68 below-market-rate apartments, 2,700 square feet of retail space, and underground parking for 109 cars. All units are stacked, single-level flats. The 86,600 square foot residential building consists of two structures interconnected by a four-story corridor. The West Building has three floors of residential units. The first floor provides commercial space, common space for the tenants, and an area for the lid over the garage ramp. The East Building has four floors of residential units. The 33,600 square foot, single-level parking structure is constructed completely below grade. The footprint of the Residential Buildings bears directly on the Parking Structure in all areas. Design challenges included construction close to the property line, seismic joints at the four-story corridor, floor framing over the retail area, and C3 requirements that mandated larger than typical slopes on the top of the Podium. Peoples Associates designed and detailed the wood residential buildings as well as the concrete podium on this project.